The KINDER REVOLUTION BALANCED FLUE GAS FIRE boasts efficiency of 94% and features a full depth coal fuel bed and an exceptionally large viewing window. The Revolution can be styled with a variety of trims and frets available from the Kinder accessories range. The Revolution is available in manual, remote or with a fully automatic Easy-Flame control option with discreet, easy access buttons which ignites the fire and allows you to adjust the heat and flame height to suit your needs. 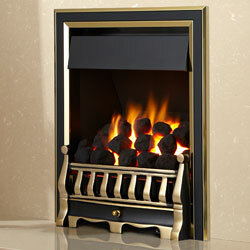 The large viewing window allows unobstructed views of the realistic coal fuel effect and helps project the large 4.6kW heat output into the room, while the 185mm depth means that the fire can be fitted into a standard 250mm cavity wall when installed with 3inch rebated surround and no need for a false chimney breast. "We believe our success stems from a combination of innovative design, investment in techonology and the highest quality manufacturing standards. As a result, all Kinder fires, including the Revolution, carry a 7 year guarantee to reflect belief in their quality and durability, and our experienced Kinder retailers are hand-picked to give you the very best advise and service. " The Apex Liberty 10 the biggest fire of the Liberty range. Maximum heat output of up to 6.2kw, a fully sequential battery operated remote control as standard. A realistic dancing flame effect on a bed of modern grey gravel, black gravel, black gravel & twigs or coal & twig fuel effect of your choice. Comes standard with a Seamless no-frame design and either a Brushed Steel interior lining as standard or optional extra Mirror interior lining which increases the contemporary look, or Black Glass Effect which provides the look of black granite interior. Can aslo come with a number of different outer frames. The Apex Liberty 6 shown here with a trim but is can also come frameless like the Apex Liberty 10. Maximum heat output up to 3.1Kw. 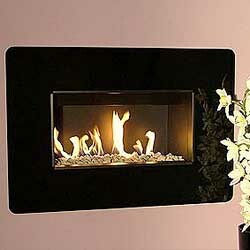 Fully sequential battery operated remote control as standard.Dancing flame effect on a bed of Modern Black Gravel, Grey Gravel, Black Gravel & Twigs or Coal & Twig Fuel Effect.Comes standard with a modern black glass surround, also available with a mirrored surround.Brushed Steel interior lining as standard or optional extra Mirror interior lining which increases the contemporary look, or Black Glass Effect which provides the look of black granite interior. You might not associate the welcoming, ageless ambience of burning logs with leading edge innovation. In fact, making mankind's oldest heating technology fit for all our futures is the focus of everything Broseley do. Broseley is named after the village in the heart of England where the business was born. It's just across the historic Ironbridge over the Severn from Coalbrookdale where 18th century ironmasters forged the industrial revolution. Cast iron, with its thermal diffusion properties, is still the material of choice for manufacturing wood burning stoves. It's sturdy nature is the starting point for the Broseley designers to create the soft edged, sculptural effects crafted into the case surfaces of stoves such as the Broseley Serrano or eVolution range In their research and development laboratory, the Broseley engineers have perfected clean burn technology, underneath the skin of your skin is a clever system of ducts which direct three different airflows around the interior. First to assist the burning of the wood fuel itself, second to preheat the air in a heat exchange chamber that burns off excess hydrocarbons in the smoke, and third to keep the glass visibly clean. The last thing you want is to obscure the spectable with the deposits of combustion inside the glass. You don't have to clean it. The airwash does it for you, sending a curtain of air down over the glass to keep it clean. One of the joys of Broseley stoves is the witnessing the play of the flames- one minute smouldering, next leaping around as you adjust the air controls. The Little Wenlock Classic Smoke Exempt AGA Stove - a dedicated smoke exempt version of the best selling Little Wenlock Classic. Specifically designed to burn woo and to burn it so efficiently as to meet the stringent requirements of the clean air act - the low particulate emissions from the smoke Exempt means that this product is fully approved to burn wood in smoke controlled zones. Nominal heat output on the smoke Exempt is 4.7kw, maximum heat output of 7kw. 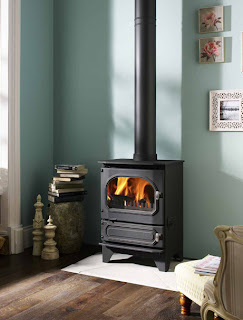 The Little Wenlock Classic Smoke Exempt, your fully approved Exempt Appliance, the perfect blend of old and new, combining cutting edge technology with traditional cast iron style and performance. 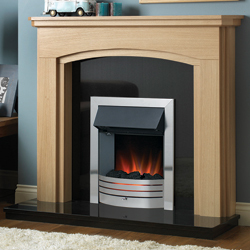 This new model from Dimplex features the incredible Opti-Myst smoke and flame effect. 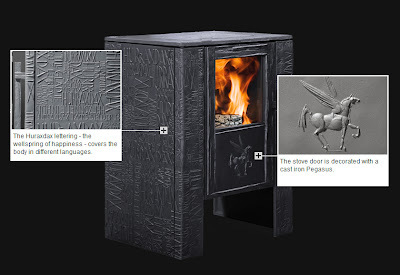 The Opti-myst flame effect is a revolution in electric fire technology. The fully 3-dimensional effect uses established ultrasonic technology adapted from commercial applications to create an ultra fine water mist that is illuminated to create the ‘flames’ and the ‘smoke’. This, combined with the Optiglo® glowing logs and shimmering ashbed, produces an effect that surpasses all expectations for realism in an electric fire. Remote control and built in thermostat mean that the Dimplex Danville can be easily controlled from your armchair, while the thermostat can help quickly take a cold edge off a room and reducing your energy bills by cutting out when the desired temperature is reached. 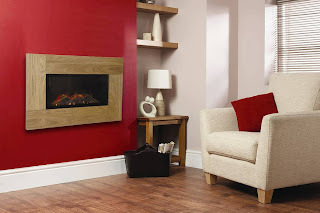 The Dimplex Danville is part of the 'Display and Demonstrate Collection' from Dimplex, meaning Dimplex recommend that you see this fire on display and demonstrated for you before purchase. Once you've seen the Opti-myst flame effect in person, no other flame effect will compare. 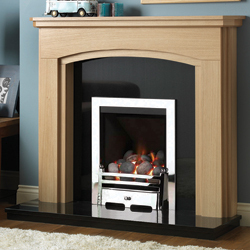 Why not head down to Fireplace Megastore and see the Danville on display for yourself. Straight, military lines give the Cannonbury its sleek, contemporary character; Acquisitions have also incorporated Georgian-inspired but modern-looking detailing from the Somerset Hob Grate for that exclusive Acquisitions feel. These economical multi-fuel inset stoves – approved for use in urban areas – can improve on the efficiency of an open fire by up to 400%. 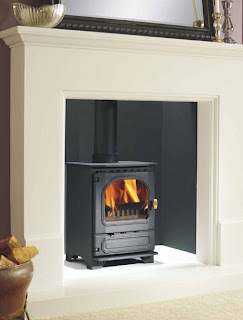 Available in two depths to suit the room size and required heat level, The Cannonbury inset stove comprises a firebox inside an outer casing, with a cavity between the two. Cool air drawn in at the base is heated and rises out of the top to evenly heat every corner of the room; this process also reduces the temperature of the stove's surface. 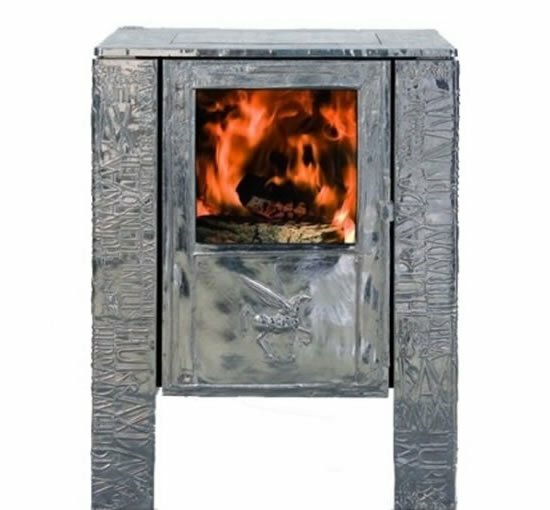 "Contemporary with a Georgian twist, this unique design can be inserted into a standard firepalce or cavity to heat your room efficiently and beautifully." Boasting up to 83% efficiency the Cannonbury is available in either a 4kw or 5kw heat output and is capable of burning wood and smokeless fuels while also boasting the Afterburn preheated secondary airwash self-cleaning system that ensures the glass stays clean of any soot. Evonic Fires is a brand of CK fires, situated in rural Warwickshire and are focused on provided a wide selection of quality fires, built in the Britain, available from many independent fireplace retail outlets. We take a look at some of their signature fires and find out what makes them so unique. 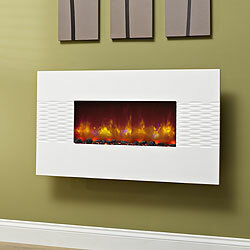 The Endeavour 3D hang on the wall electric fire. This ultra-slimline electric fire utilises the same technology that makes the Brilliant Newdawn-E so popular with the choice of three different fascias to create a stunning electric fire that not only looks good, but also gives a great heat output for an electric fire at 2kW with built in thermostat. The Endeavour uses a log fuel effect to create a very realistic looking electric fire, also creating the illusion that the fire is deeper than it actually is, further adding to the realism of the flame effect. Available in the almost standard black glass finish, the Endeavour 3D also breaks from the norm offering a Stone effect finish. However the crowing glory of the Endeavour 3D is the solid Oak Fascia that is available, this truly combines the best of having a natural wood surround and inset fire with having a modern hang-on-the-wall electric fire. The natural grain of the fascia frames and complements the flame effect in the centre, adding even more ambience to that of a standard black glass electric fire. Evonic Fires use the latest technologies in 3D LED designs which produce a beautiful flame effect for just £1.00 per year based on 5 hours usage per day. Alongside the stunning Endeavour 3D, Evonic Fires also offer the impressive Volante and Octane Suites, these completely break the mould of traditional hang on the wall electric fires, with both available as standard in a Calcite White finish (Octane shown right) as well as a solid oak finish, these hang on the wall electric fires are true focal points, projecting into the room with a realistic flame effect that can be added to utilising the optional log fuel effect. The Octane and Volante also boast smoked glass side panels that reflect the flame effect and give added depth and realism to these fires, coupled with the flame effect only setting means you can enjoy the ambience of sitting in front a fire, without the heat. And built with almost exclusively British components, you can be sure that when buying an Evonic fire, you are supporting the British economy, especially important in these difficult financial times. You can now view the Evonic Endeavour 3D complete with black glass fascia, alongside the Evonic Volante and Octane hang on the wall electric suites and the Portia on live display at Fireplace Megastore. A father and son from Crewe have been prosecuted for carrying out illegal gas work. installing central heating in a flat in Market Drayton, Shropshire, despite not being Gas Safe registered. Shane Cavanagh issued a Landlord's Gas Safety record for the flat after completing the work in 2012, but when the tenant moved in soon after they discovered a gas leak. Shrewsbury Magistrates heard on 20 February that a Health & Safety Executive (HSE) investigation found both men had previously been Gas Safe registered but allowed their registration to lapse. Trading as Gas Master, Peter Cavanagh's registration lapsed a few years ago as he intended to focus on quotes and administration, leaving his son to carry out the actual gas work. However, Shane Cavanagh's registration lapsed in 2011 and Peter Cavanagh carried on doing gas work. Peter Cavanagh was contacted by HSE in November 2011 after being informed by Gas Safe Register that he was carrying out gas work. He signed a form from HSE saying he would not carry out gas work again while unregistered, although he had already taken on the work at the property in Market Drayton. In March 2012, Peter Cavanagh was issued with a Prohibition Notice by HSE banning him from carrying out gas work until he was both competent to do so and registered with Gas Safe Register. A similar Prohibition Notice was issued to his son in July 2012. Peter Cavanagh has since retaken his qualifications and re-registered with Gas Safe in September 2012. Peter Cavanagh pleaded guilty to breaching Regulation 3(3) of the Gas Safety (Installation & Use) Regulations 1998. He was given an 18 week prison sentence, suspended for two years, alongside 240 hours of unpaid work, and was ordered to pay costs of £5,547. Shane Cavanagh pleaded guilty to breaching Section 3(2) of the Health & Safety at Work etc Act 1974. The court imposed an 18-month community order, in which he must complete 200 hours of unpaid work, and ordered him to pay £2,552 costs. HSE inspector Janice Dale said: "Anyone who carries out work on boilers, hobs, ovens, fires or any other gas appliances without being on the Gas Safe Register is breaking the law. Peter Cavanagh carried out work in domestic premises knowing his registration had lapsed and despite giving HSE assurances that he would stop such work. "Shane Cavanagh signed the Certificate stating that the installation was safe, although he was not legally entitled to do so, and a gas leak was found shortly afterwards. Both men were putting tenants and homeowners at risk." 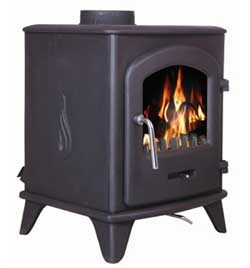 The Circo is a freestanding DRU gas stove with a unique curved glass pane. 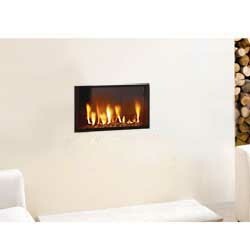 Its design creates an optimum fire experience from several corners of your living room. The circular design also means the Circo is eminently suited for corner placement. 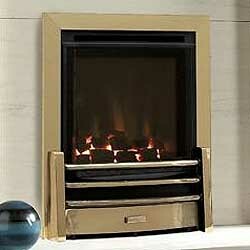 Moreover, the Circo has an output of 7 kW and as such is capable of heating most rooms. With remote control as standard, the heat output and flame effect can be adjusted without having the move from your armchair, while the balanced flue system means that this fire can be placed practically anywhere in the room and create a stunning focal point. For many years Dunsley dealt mainly in the manufacture of solid fuel open fires, boilers and gas fires, however as tastes change and needs evolve we have recognised this fact and created two different types of Multi-fuel Stoves. 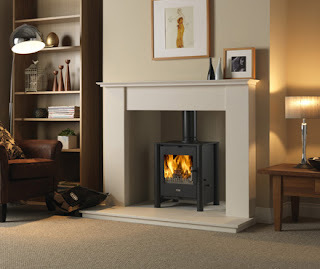 These stoves are manufactured to the highest standards, in the UK, and using the most relevant methods and the highest quality materials and components. 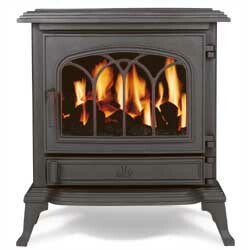 The Highlander 7 is the middle stove in the Highlander series. It meets the relevant British standards for the whole of the UK and has been developed using the best burning technology to give you a stove with a clean burn and high efficiency. The Super Air Wash System has been designed to keep the glass clean to give a full view of the superb flame pattern created as the flames rise to meet the incoming air, this causes secondary combustion to take place, resulting in clean burn with dancing flames. The Highlander 5 has been developed to increase the choice of the householder, using the same superb burning technology as the Highlander 7. Same air wash system, same shaker system only slightly smaller, but can still take logs up to 280mm long, same range of sustainable fuel, same metallic black finish, solid brass handles as standard, with black handles available on request. The Highlander 5 differs slightly from the Highlander 7 as the overall size is smaller, this has enabled the design of the door to be altered, so that on the Highlander 5 there is only one door to open for re-fuelling and removing ashes. This also means that the safety precaution to prevent overfiring is automatically provided for. How it works The Highlander 5 has two combustion controls exactly as the Highlander 7, to control the burning rate, with efficiences of up to 70 percent. If you have a fireplace in your home that you do not want to hassle with adding the wood and sending off fumes, or you have no area in your home for a fireplace, then an electric fireplace is probably the best option for you. 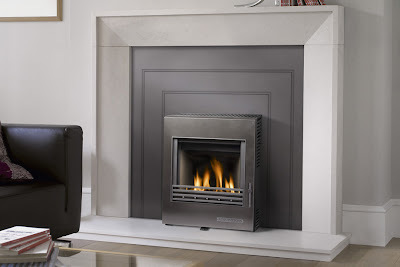 Electric fireplaces are commonly found in apartments, office buildings, or other areas where there is a limited amount of space or it is not possible to install a gas or solid fuel fire. 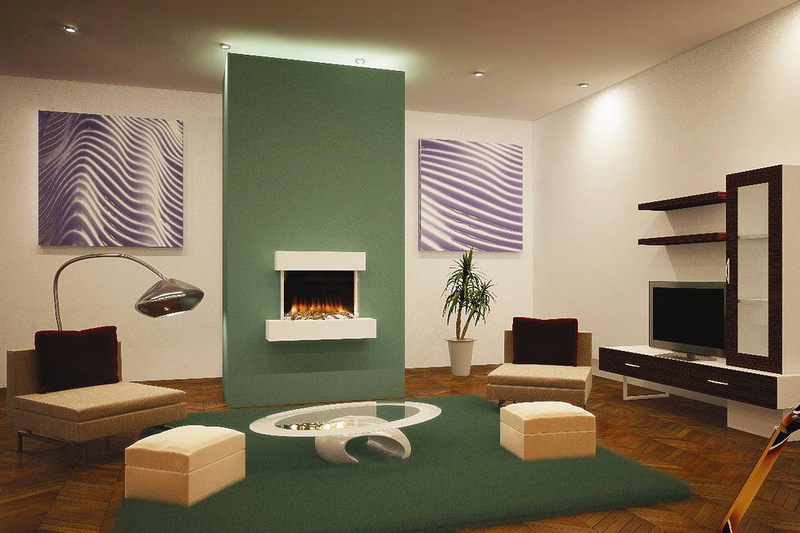 While these fireplaces do not give off the same amount of heat as real fireplaces, the overall look is still the same. There is no burning of wood and the flames are simulated to make it look real. The actual purchase and installation process of electric fireplaces will probably amaze you. It can all be completed in as little as one day. 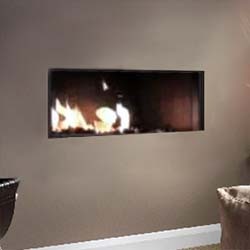 While this might sound unbelievable, it is very possible and almost anyone can install an electric fireplace. You do not need to hire a handyman or a specialist, and you can do it with the help of a partner, a screw driver and a few other small tools. This is a breeze compared to other fireplaces, such as gas fires or wood burning fireplaces. Your first step is the purchase of the electric fireplace. You will need to browse and decide which look and style of fireplace it is that you are looking for. It is best if you search the Internet first, so that you can see how it will look in your home. Visualizing it in your home is often hard to do when you are in the store. Keep in mind that an electric fireplace is best in a small room and it will not efficiently heat an entire house or even a large room. They will consume a large amount of power, but if you turn off the central heating in that room, then it will keep the area nice and warm. Your main choices are based on the style, but you should keep your eye out for energy efficient models. Some companies offer electric fireplaces that have a thermostat installed in the heater. This allows you to set the thermostat at your desired temperature, and then when that temperature is reached, it will automatically shut off. This will prevent the fireplace from running all day or when you are not home. After you have purchased a fireplace, you need to decide the location that is closest to a power outlet. The electric fireplaces work with a standard 13 amp plug, and it is essential that you have this so that you can plug it in. You can also use an extension cord, but this is not recommended as the safest way. This might mean that you have to change your original location that you had in mind in order to plug it in to the power source. If your location does not have a plug, then it is possible to have one installed in that particular location. However, it will cost you money to have an electrician move a plug socket. We recommend that you place the electric fireplace in an area where the plug and the cord will be mostly hidden. This will allow your fireplace to look the most real, nobody wants to see an unsightly white or black flex hanging from their fireplace. Many models come with a large enough mantel that will surround the fireplace and this might be your only option as far as hiding the cord. After selecting the appropriate location, your next step is to determine how the unit hangs from the wall. Many use screws or hooks, and the installation manual should tell you everything that you need to know. Some units are completely freestanding so you will not even need a tool in order to install the unit. Once you have the unit attached to the wall, the only installation left is plugging it in. The chimney on the roof of the Sistine Chapel, which will emit the smoke to indicating the election (white smoke) or non-election (black smoke) of a pope, was installed on Saturday 9th March, three days before the Conclave began. From within the Sistine Chapel we saw scaffolding around the stoves that will burn the ballots to erect the stove pipe that releases the smoke from the roof of the chapel. After the chimney was installed it was submitted to a series of tests using chemicals to emit a yellow smoke so as not to confuse the increased number of passers-by in St. Peter's Square. The chimney is just the last piece of the mechanism that will produce the smoke. The two iron stoves it is attached to were installed yesterday. The first stove, cast in 1938, has the dates of the five Conclaves it has been used in etched upon it—from the one electing Pius XII in 1939 until the latest, in 2005, when Cardinal Ratzinger became Benedict XVI. This older stove (on right) is used to burn the balloting papers. The modern one (on left), equipped with an electronic device, will add the chemicals to produce the black or white smoke indicating the result of the voting until the election occurs. A mixture of vegetable-based chemicals that produces the white smoke, which tells the world that the cardinals have chosen a new pope. There are two voting sessions planned for each morning and each afternoon that the Conclave continues. At the moment, the chimney is at the centre of the media's curiosity and as of last night holds the attentions of millions of people around the world. Quite possibly the most watched chimney of all time. A sweep who did not remove a bird's nest blocking a chimney flue has been fined £5,000 over the death of an ex-miner from carbon monoxide poisoning. Philip Jones, of Porthcawl, was also ordered to pay £2,500 costs after the Health and Safety Executive (HSE) prosecution at Cardiff Crown Court. Derwyn Rees, 73, of Llangynwyd, Maesteg, died in September, 2008 - the day after Jones worked on his chimney. The sweep admitted a breach of the Health and Safety at Work Act. According to the HSE, the court was told that after Mr Rees's death further investigations revealed an extensive bird's nest had been left inside his chimney. Mr Rees had called in the sweep after experiencing problems keeping his solid fuel fire alight. Although Mr Jones, who had been a sweep for 25 years, had encountered a blockage while sweeping, he did not check to see if his brush cleared the chimney pot which would have indicated if it had been cleared. In addition, he failed to carry out a proper smoke test after finishing the job, give advice to Mr Rees on ventilating the property, or give any verbal or written warning. An inquest in Aberdare in October 2010 ruled that the bachelor had been unlawfully killed. After the Cardiff hearing, HSE inspector Stephen Jones said: "This was a tragic incident and a great shock for Mr Rees' sister and their local community. "Chimney sweeping is a vitally important job. Sadly Mr Rees paid for substandard work with his life." Mr Jones added: "Sweeps must ensure work is done thoroughly and householders are given information about proper ventilation of their homes to ensure similar tragedies do not happen in the future." Mr Rees's niece Janet Jones said: "Derwyn's death was an avoidable tragedy and has had a huge impact on the family. "We hope this case sends a clear message to sweeps so that this sort of incident does not happen again and other people are not put at risk. She added: "Every year around 15 people die from carbon monoxide poisoning and prolonged exposure can also lead to paralysis and brain damage." Martin Glynn, President of the National Association of Chimney Sweeps (NACS), said: "This tragic case highlights the necessity of using a trained and competent chimney sweep who works to a professional standard as stipulated in the National Code of Practice. "Unfortunately the chimney sweep in this incident was not registered or approved." I am delighted to tell you that the Flavel Rocco has now been improved and re-released by BFM Europe. The Rocco HE has an improved heat output of up to 4.2kW with a net efficiency of 87%. This increased level of efficiency is achieved using a heat exchanger, which draws cool air in from the room and emits back into the room as warm convected heat, and this combined with the radiant heat of the glass front, allows us Flavel to achieve these impressive results. The heat exchanger does change the total depth of the engine from 333mm to 385mm. BFM Europe has also improved the functionality of the Rocco by upgrading the semi-automatic remote control system to a fully automatic remote system with thermostatic operation. It is now much simpler to ignite and control the fire to achieve your desired room temperature. The Flavel Rocco HE boasts the same popular aesthetics of the trim with four model options; black back with black trim, black back with silver trim, black back with champagne trim and cream back with champagne trim. Struggling to get to grips with all the wood-burning stove jargon. Here’s your one-stop guide to some of the main terminology you’ll come across when buying a wood-burning stove. A system that forces a flow of air from a vent at the top of your stove down over the glass in the door to prevent tar and soot being deposited on the glass. The removable or fitted pan that sits below the stove to collect all the ashes. A metal plate sitting above the stove. It partially blocks the exit for the hot flue gases created by your fuel. This helps to keep the gases in the stove for longer to make sure they have fully burnt, and also keeps to heat in the stove for longer to give more opportunity for your room to heat. A system used in modern stoves in which an additional air supply is introduced to the stove. This encourages burning higher up the stove, with the intention of stopping flammable gases disappearing up the flue without being burnt. The main inside part of your stove where all the burning takes place. An insulating material used inside the stove to protect it from the fierce heat of the fire. The pipe that takes the gases away from your stove. The bed that your fuel sits on when it is burning. The main source of air to provide combustion inside the stove. In multi-fuel stoves this is usually at the bottom of the stove. A plate used to seal the bottom of the chimney in an open fireplace, which will have a hole through which the flue pipe passes (pictured above). The Portway 1 mulit fuel stove is a compact, contemporary steel stove which has an ultra slim body to allow it to be installed in a wider range of fireplaces, yet still have a large viewing window. 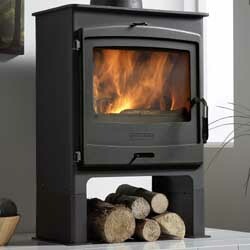 The Portway one has a steel body which are 5mm thick and comes with cast iron doors and grates a total weight of 56kg. This stove also has a air wash system so the glass doesn't get dirty, also this can come with longer legs as an optional extra and a heat output of up to 4.8kw. 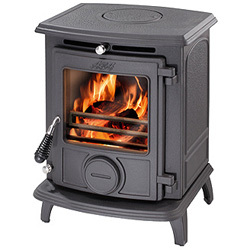 The Portway 2 contemporary stove is also a steel stove which like the Portway 1 has a large viewing window and is exceptionally easy to operate. 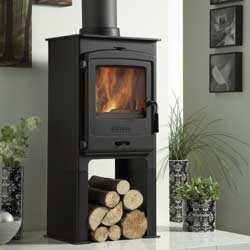 This Portway 2 is available in two stove colours black or charcoal, also you have a choice of door colour a matching door, Ruby enamel or Arctic enamel. Also has a air wash system and available with longer legs and a heat output of up to 7kw. A Brixham gas fitter has appeared in court for carrying out unsafe work on boilers and illegally issuing landlord gas safety check records in Torbay while claiming to be registered. Steven Nurse was found to have produced 10 gas safety certificates using the name and Gas Safe Register and Corgi identification numbers belonging to a legitimate registered gas engineer. In a prosecution by the Health and Safety Executive (HSE), Exeter Crown Court heard that Nurse had also installed two boilers, signed-off work on another two and had serviced gas boilers all while falsely claiming to be a member of the Register and its predecessor, Corgi. The HSE began investigations after Gas Safe Register received complaints about Nurse’s work. He was found to have installed a gas boiler to undersized pipework and failed to seal the boiler flue correctly endangering the lives of people inside the domestic property in Brixham with escaping poisonous gas fumes. Nurse pleaded guilty to breaching 26(1) of the Gas Safety (Installation and Use) Regulations 1998 and was given a two month prison sentence, suspended for 12 months. Nurse also pleaded guilty to breaching Regulation 3(3) and 3(7) of the Gas Safety (Installation and Use) Regulations 1998. He was fined a total of £2,000 and ordered to pay £500 in costs. He was also ordered to pay total of £1,000 compensation to property owners. "Nurse’s shoddy work on the boiler could have killed someone. "This incident shows how important it is for gas fitters to become properly trained and registered gas engineers. "All gas engineers must be members of the Gas Safe Register by law so customers can be sure they are dealing with someone who is properly trained and qualified to do the job. "Unregistered installers who carry out gas work could expose people to unacceptable risks that can prove fatal. Any business or sole trader who carries out work on any gas appliance without being properly trained and registered is breaking the law and HSE will not hesitate to prosecute." "Every Gas Safe registered engineer carries an ID card which not only proves who they are but also gives details of the kind of work they are qualified to carry out. We always encourage the public to ask to see an engineer’s ID card and to call us on 0800 408 5500 or visit www.gassaferegister.co.uk to check the details. A registered engineer will never mind being asked and it helps us all to make life more difficult for the illegal gas fitters." Further information on gas safety can be found on the HSE website at www.hse.gov.uk/gas. 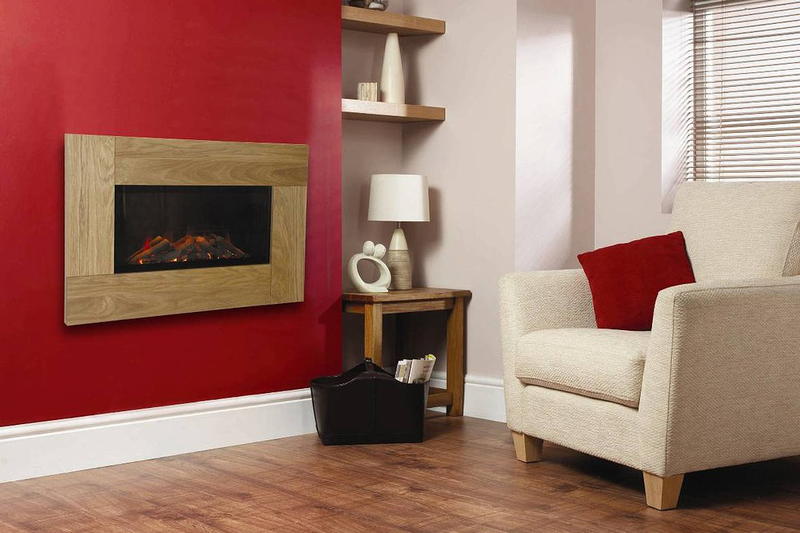 The Kinder Oasis Plus is a full depth open-fronted high efficiency gas fire. you can now achieve the look of a real open coal fire, combined with the convenience of gas fuel, at an incredible 74% efficient. 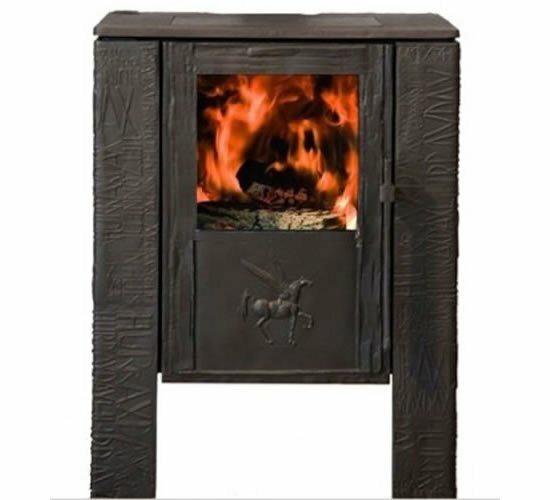 This stunning fire features an extra wide coal fuel effect bed, a beautiful flame picture and offers an incredible 4.6kw heat output.suitable for installation into standard chimneys and pre-fabricated flues, the Kinder Oasis Plus comes with a choice of manual control, slide control, easy flame control or remote control and can be styled to suit your home with a wide range of trims and frets in multiple colours. this Kinder Oasis can also come as glass fronted for even better efficiency. 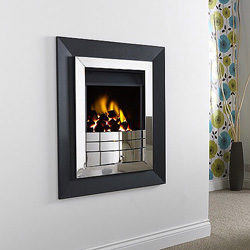 The Kinder Navada HE gas fire is a slimline high efficiency fire with an efficiency rating of upto 89% and will fit almost any chimney or flue including pre-cast. the Kinder Navada can come with a choice of coal or pebble fuel effect and a large veiwing window and has an incredible heat output of upto 3.2kw, also comes with a number of diffrent styles of trims and frets in diffrent colours to suit your home. Congratulations to Paul Bird and Aled Davies on winning the 2013 Legend Fires North West Stages Rally! with Dave Bellerby and Kevin Protor and Chris Anderson and Chris Thirling coming in second and third respectively. The 2013 Legend Fires North West Stages took place on Friday/Saturday 8th/9th February, a week later than in recent years. It was the tenth successive year that Legend Fires, the company owned by Skoda Fabia WRC driver John Stone, have been the main sponsors of the Blackpool based event. His white, red and black Skoda Fabia adorned in the company's livery seen flying around the stages. Producing a large range of gas and electric fires such as the stunning new Legend Virage HE (High Efficiency) gas fire, Legend Fires are one of the premier manufacturers in the UK and proud to sponsor such an event on an annual basis.